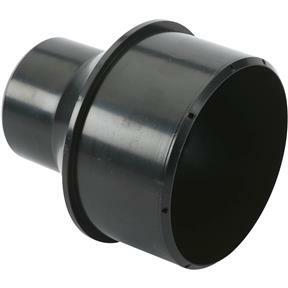 This Adapter is for Shop-Vac® and Sears® shop vacuums.Size: 4" x 2-1/2" OD. This Adapter is for Shop-Vac® and Sears® shop vacuums. Size: 4" x 2-1/2" OD. I purchase these all the time from you folks and the product is good and the service is good. I purchased this to connect my belt sander to the dust collector but I have not used it yet. I have one attached to all of my tools. I just change the hose out. Very durable, heavy duty material and works perfectly! This adapter worked for the 12 sander that I bought. This feels much more robust and thicker material than I was expecting which is a great thing in a shop. I unfortunately had an absent minded moment and ordered this to connect directly to the 4" dust exhaust of a G0555LX bandsaw. 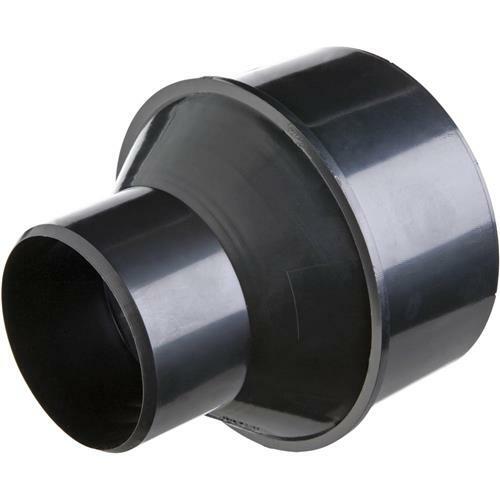 The 4" side is sized to fit inside of a 4" dust collection hose. This is the same size as the exhaust port of the machine, so it needed a short length of tubing to couple the adapter to the saw. This makes sense and was my fault for not thinking when I ordered it. I included this note here in case it helps anyone out in the future to not make my same mistake. Performs as expected, but make sure you buy the coupler because the port on the saw is the same size. It would be better if this adapter fit inside the dust port on the saw. The reducer is fine if you are going from 4 inch hose to 2-1/2 in hose. I bought it to go from my tablesaw 4 inch opening in the bottom to 2-1/2 in hose. My mistake. Got this to downsize the dust collection on my Grizzly G0883P table saw, it was a "recommended accessory". Dosn't slip over or into the port on the tool, it's jut quiet the right size. Right now tape is doing the job. Worked out great! I use old rubber car radiator hoses and some duct tape to rig up my system. Might not look so great but is inexpensive and efficient. When I purchased this I assumed that it would slide over the dust collection port on my Grizzly band saw but its the exact same size as the port. So I ended up cutting a plastic to wrap around the adapter and the dust port on the bandsaw and secured it with a hose clamp. It works fine now I just wish it would slide over the port so I wouldnt have to rig it. Used to connect to band saw. Everything fit right in. Excellent product. Fits right and helped up adjust piping and Hoses for our vac system. Bought this a month or so ago, and it did the job! I'm slowly building out my dust collection system, and this was an must-have to be able to connect my miter saw to it. I used a piece of 4" drain pipe and two 4" drier vent clamps to secure the adapter to the dust outlet and it works fine. I already had one and needed another and this was a good price. I have used this fitting for about a week with no problems. I bought this for my new G0771: it does not fit the 4 inch vacuum port thereon, being the same size. MacGivered a work-around. And the shipping charge was huge. 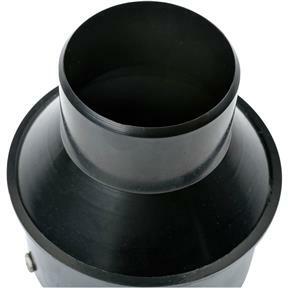 Generic dust collector adaptors and fittings are designed to fit the various sizes of dust collector hose. They are not designed to fit directly into a machine dust port without the use of some additional hose. A small length of hose is required from the adaptor to whatever machine is being used.